Now, this quilt, I LOVE! It was inspired by this flickr group. 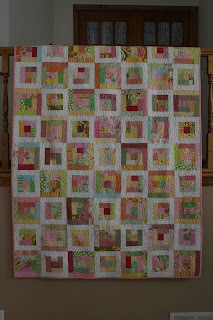 It is a total scrap quilt except for a bit of the white. 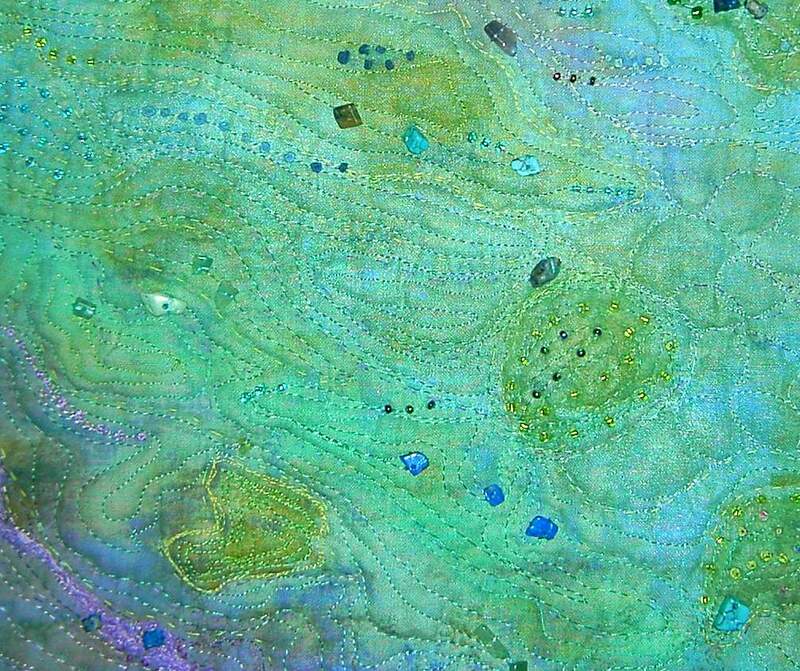 It is a lap size, measuring 54" x 70". I will be sending it to my friend, Jill, who lives in AZ, and is battling cancer. I will be signing off for the rest of the week. We are on spring break (which means that we got dumped on with snow) and we are headed up to MN to spend some time with my sis. Be good while I'm gone. Can I just send all my fabrics to you and see how fast you can come up with finished projects of any kind? I have never known anyone accomplish as much as you do and still have family time and daily time and all of other than craft time. YOU amaze me! Have a great spring break ! I can see why you love this one. It's beautiful! 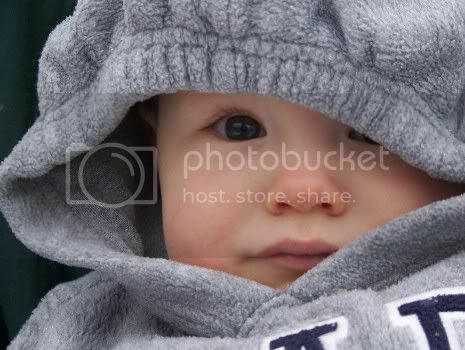 i love this one too. safe travels sweet friend! What a pretty quilt! It's SO Sweet for you to send it to your friend! I'm sure she'll love it. Have fun with your sis! I love it! It is so pretty...what a treat for your friend. Have fun with your sis. That quilt turned out so nice. It is fun and bright and I know your friend will love it...it should really cheer her up. LOVE this quilt! Have fun with your sister! Give me a wave when you pass St. Cloud! So pretty, I like how all of your scraps go together! A very pretty quilt for a very special friend. Have a safe trip to MN. Oh it is just lovely and I am sure your friend will love it too! What a wonderful quilt. Such a wonderful gift. I'm in love. A pretty quilt it is, and what a lovely gesture. Safe travel wishes. The quilt turned out great! Like everything you make! Have a great time in MN! oh, i love that quilt too! it's really lovely. I was just looking at various quilts on flickr this morning, and this one popped up... I starred it as a quilt I liked, and what do you know.. you made it! I saw this on flickr when I joined the challenge. I hope mine comes anywhere close to this! Have a great time in MN! Oh my gosh, that is gorgeous!!! Have a great March break. Ours is just finished and we got major snow. This one is a beauty! 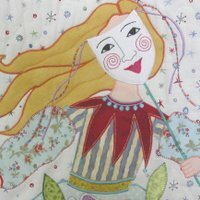 You are so prolific with your quilting!! 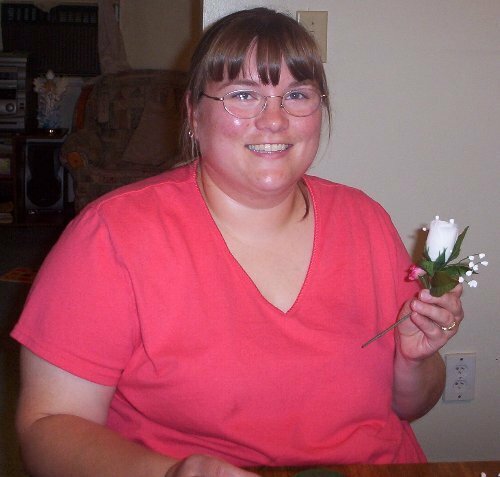 I love visiting your blog and seeing all the eye candy! Oh Yes I LOVE this quilt too. So simple yet so stunning. I'm sure your friend will LOVE it. I'm off to check out that site and have a go. Hope you have a nice Spring Break. Your friend will be thrilled to receive this quilt! It’s so lovely. I hope your friend will win her battle against cancer. Enjoy your break! This quilt is sooooo gorgeous! But I love the green one, too! Have a nice break and visit with your family. It's absolutely beautiful. She will love it. What a nice gift. This is a beauty Amanda! I hope you guys have a great trip! I can see why you love this one...it's just gorgeous! I'll send good wishes to you and your friend. I hope she's doing well with her battle. With this quilt I'm sure she will be warm and feel how much she is loved. You are a good friend! Have a wonderful holiday break. Enjoy. Oh yeah! That's a winner alright!! It came out so well! I love how you have every other block framed in white. Sets off the scrappy blocks so well without having sashing. Very inventive! Will you show us how to make this Quilt too. I really love it too. WONDERFUL! I love all the great fabric choices and I spot a few of my favorite fabrics in there too. This is so colorful and spring-like and perfect. Beautiful work! so pretty! I don't know how you finish all of these beautiful projects so quickly! You are so incredibly talented. 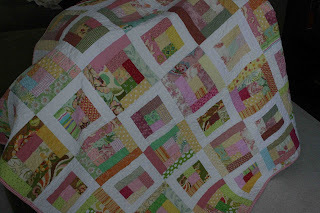 Thanks for sharing that flickr group...a scrappy log cabin quilt is on the horizon for me! Love the look of this quilt. I'm amazed at how fast you get things done! Have a great week. i love this one! you are so sweet. my prayers are with your friend. have fun with your sister. i will miss ya! Beautiful quilt! Have fun in MN!! really i love, love, love it!! can i make one too? boy, am i a copycat lately or what?! Very cute and especially scrappy. thanks for the great inspiration! You're so cute with your recent titles and feelings about your quilts. This one, too, is stunning, and it's very touching that you're sending it to your friend. Have some wonderful time with family - away from the computer, enjoy the holiday, and return safely! That's a lovely quilt! Enjoy your trip. Beautiful, beautiful. 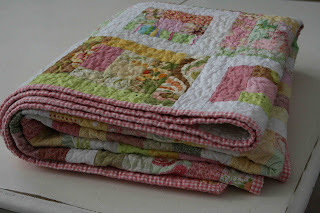 I love scrap quilts so much and yours is just terrific. just beautiful, safe travel and enjoy your time away..
Oh, your friend is going to love it and I'm sure it will lift her spirits and bring a ray of sunshine. Enjoy your holiday and travel safe. A perfect quilt for her. Very cheery. She's bound to feel the love and good wishes. Bundle up it's cold and snowy up North. What a beautiful gift for your friend. Have a great break. Wow! that is beautiful!!! Your friend is sure to cherish this!!! Is it really scraps or fabrics from a collection? Just beautiful! I'm in awe of all your quilting action. oh my this is lovely and delicate. You have an amazing colour sense. It's beautiful and I am sure this will cheer up your friend. Gorgeous! Love, love the colors!! Yep- the quilts a beauty! What a beautiful quilt. The white really makes it pop. I love it! It is beautiful!! By the way, I love your blog. I found it while trying to find basting advice, and I am hooked. Thanks! I just stumbled across you blog. What an inspiration! I'll be visiting you often. i´m pilar. i am a spanish woman and i love the patchwork. your blog is very beatiful and great. excuse me but i d´ont know to much english. As always, I love your quilts, but this so far, is my favorite! Love the colors and the scrappy log blocks! Are there directions here to make these blocks? stunning! i love all of that white. such a sweet gift. one that will bring your friend a lot of joy. hope your Easter was fantastic! What a beautiful quilt for your friend. I'm sure she will love it. 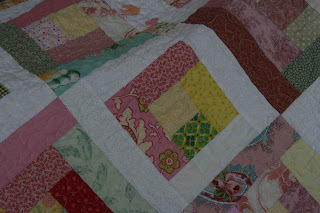 I love your quilt too - you do wonderful work and I am sure your friend will be very happy receiving it ! 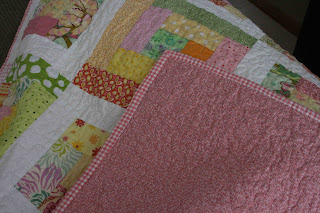 your quilt is lovely and i think it a really sweet idea sending it to your friend she'll love it! Beautiful quilt. Perfect gift for your friend. It's beautiful. They mut beautiful fabrics, muyu are well combined. Beautiful quilt! The binding looks very nice. This is so gorgeous. I love the fabrics and design. I can so appreciate all the beautiful and hard work that this quilt exudes!! So Lovely!! I just found my way through your blog. Great quilt. I will come back. Have a great Sunday! Just so beautiful, really like how you have set your big and little log blocks. You are very inspiring. Thank you for sharing. Are there directions to this quilt? Block size? Strip width? 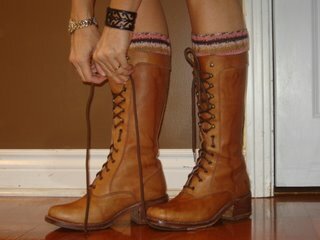 I love it and have many scraps to make it. Love your blog. I have been looking all through your blog and I am amazed at your wonderful and prolific work! If I may ask, did you have all the fabric on hand as scraps for this quilt or did you go buy especially co-ordinating fabric? fat quarters perhaps? I would love to know your "recipe" for this quilt! The colors are wonderful. this was indeed all scraps from my scrap bucket over several months. some of the white was bought or from the stash, but the rest was truly scraps. I'm sorry to say that I am not ready to share the pattern for this quilt at this point.